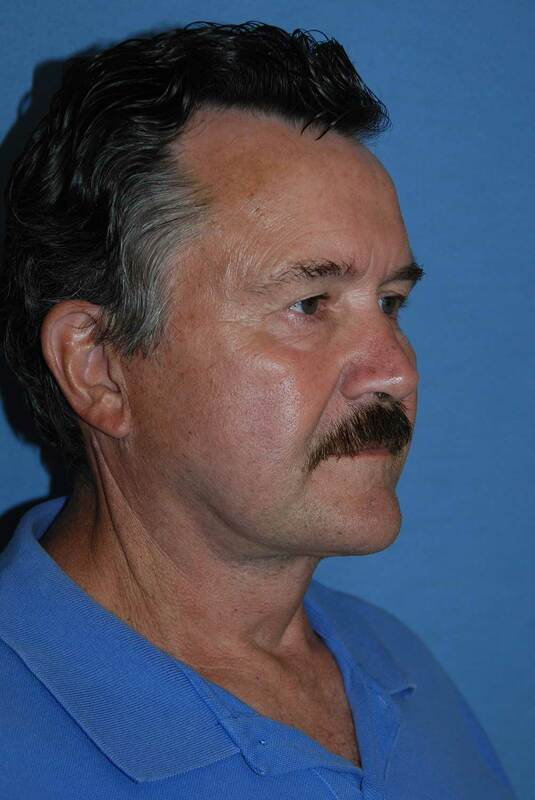 We have over 20 combined years of experience & have performed over 1400 Face & Neck Lifts. Feel Young and Beautiful Again. Trust Your Face with a Facial Plastic Surgeon. "After the facelift, I feel more confident. Younger guys are looking at me more. I'm more excited about the way I look, and it has made me feel a lot better. A lot of people don't know what I had done. They just tell me I look great." —S.K. 60's Female from the Pacific Northwest. Learn more below why People from all over the world have choosen Dr. Young and Our Team including Patients from Germany, Syria, Dubai, Australia, New Zealand, England, Lebanon, Italy, Singapore, China, Korea, Japan, and the Netherlands. Learn Why a Professional Sports Team Coach, Executives of Fortune 500 companies & People All Over the World Have Come to See Seattle's Facelift Expert Dr Young. Learn the Beauty Advantage: You can still grow old like these people, but you don't have to look old while you're doing it! Nowadays, people understand that it is okay to do something about your looks. A Facelift can possibly be that procedure that helps you get more out of life. More research is being conducted in the scientific world that is finding that feeling good about yourself can have major positive implications to your health. Looking and Feeling better are many times synonymous. For most people, looking better gives them the extra confidence that can benefit them in so many ways in addition to Health. Dr Young, who studies beauty all the time, knows just how important beauty can play in all of our lives. Based on his research and the literature regarding Beauty (Click Here to Learn More About his New Theory on Beauty), he knows that having good things happen in your life is related to our appreciation of beauty. Related to this, because we like things to be in order and symmetrical in our lives, we are attracted to Beauty. Dr. Young has found that essentially Beauty is really just order in the face. Click here to learn more about the Beauty Phenomenon and the Beauty Advantage. We look forward to meeting you and discussing more about this. You can also click here to learn more about the Benefits of Beauty. Award-Winning Dr. Philip Young has performed over 1,300 Face Neck Lift surgeries and performs 400-800 major cosmetic and reconstructive procedures each year. He is a published author in multiple major plastic surgery textbooks and peer-reviewed publications, including Dr. Young's Theory on Facial Beauty (Click here to See Dr. Young’s Research). There are many reasons that set Dr. Young and his Team apart (Follow this to find the Top Ten Reasons to choose Dr. Philip Young). Because of these qualities, people from all around the world travel to see Dr. Young including Germany, Australia, England, Lebanon, Italy, Singapore, China, Korea, Japan, and the Netherlands, not to mention people all over the United States and Canada. However, above all these things, what makes us special is Dr. Young’s groundbreaking Theory on Facial Beauty called the Circles of Prominence. Facelift | Mini Face Lift by Bellevue | Seattle’s Dr. Philip Young & Aesthetic Facial Plastic Surgery: Dr. Young and his Team have extensive experience in using minimally invasive techniques to help patients achieve lasting results without the downtime associated with older procedures. He improves the visible signs of aging by removing excess fat, tightening underlying muscles, and re-draping the skin of your face and neck. You can read about our Philosophy and Dr. Young's Theory on Facial Beauty to find out why Dr. Young and our Team may be the best choice for you. When performing facelift surgery, Dr. Philip Young of Seattle | Bellevue typically begins with creating incisions within the hairline, above the temple and along or just inside the ear, ending behind the ear (You can scroll down the page to see examples of these Incisions for your Face Lift). This allows access to tighten underlying tissue, remove excess fat and reduce sagging skin. 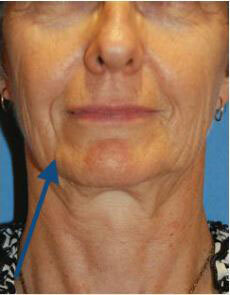 Depending on the needs of each FaceLift patient, a second incision under the chin is sometimes necessary. This is done to specifically address aging concerns in the neck. If skin tone is good and only mid-face aging or excess fat in the neck will be corrected, abbreviated techniques with shorter incisions may be the best procedural approach. Liposuction techniques may assist with removal of fat deposits. Below is an example our facelift incision. 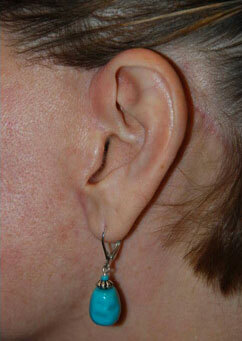 This incision started underneath the sideburn, proceeds along the front of the ear and then behind the ear. Follow this link to Learn more about the Face lift Procedure. You can scroll down and read our Frequently Asked Questions regarding Facelift and Face | Neck Lift Procedures. 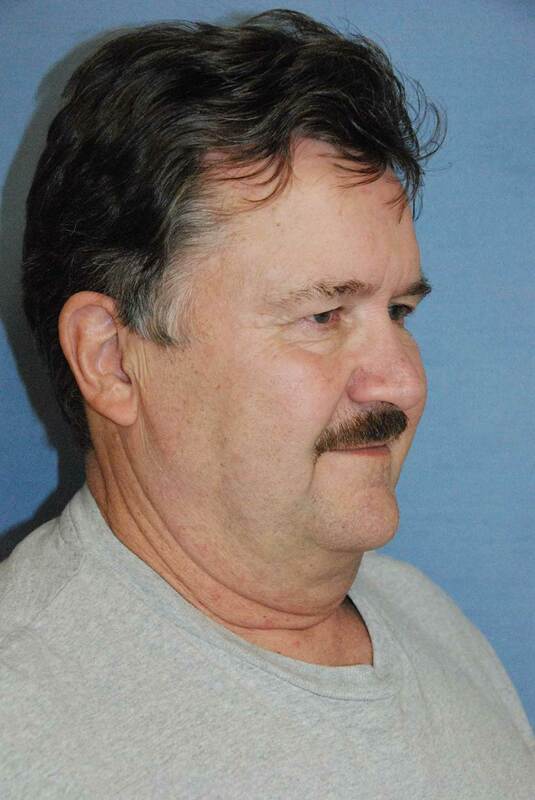 "The Face lift I had with Dr. Young makes me look way better than before. I look 15 years younger. I feel great about my results. I look less tired. I look at least ten years younger.&" —L.S. There are links to the right and below that you can follow to learn more about the Face Lift Surgery. 1. Learn More about Facelift here: Face lift Explanations and Options. 2. Read about our The Face Lift Recovery. 4. Read about some of our Face Lift Testimonials. 5. Learn more about our exciting new Incision Less Face Lift Alternative: YoungVitalizer. 6. 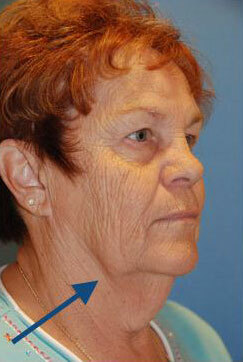 Click here for more Facelift Learning Videos & Facelift before and after photos. 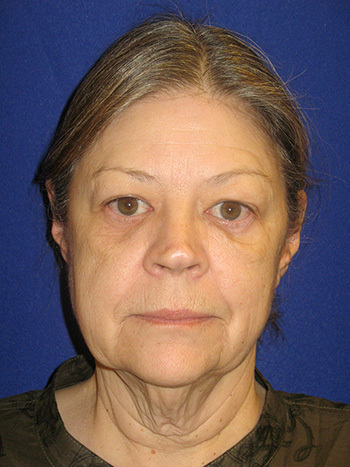 Before Upper and Lower Eyelid Lift, Face Lift and Platysmaplasty Neck Lift with Liposuction of the Neck. This patient had skin and muscle taken from the upper eyelid and skin and fat from the lower eyelid in this quad blepharoplasty. 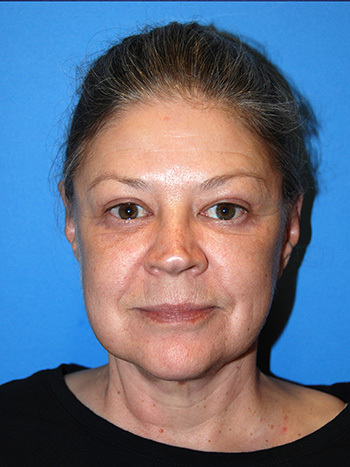 After Upper and Lower Eyelid Lift, Face Lift and Platysmaplasty Neck Lift with Liposuction of the Neck. This patient had skin and muscle taken from the upper eyelid and skin and fat from the lower eyelid in this quad blepharoplasty. Your sutures usually come out 6-7 days later. We usually have you wear a wrap for the first 1-2 weeks non stop and then for 2 months at night. Drains are sometimes used and these usually come out 1-2 days later. Most of the swelling is gone at 1 week but this all varies depending on the person. You may have minor swelling that lasts longer than a week. Having us follow up with you on a regular basis during the first week is important for us to make sure you are headed in the right direction. Based on wound healing studies, you will have 20% of your healing in 2 weeks, 60% in 6 weeks, and 80% or more at 6 months. This is based on how strong your tissues are and can be different from the swelling and bruising that you see. As you may know, it is very unlikely that only 60 % of your bruising will resolve at 6 weeks. Most bruising lasts about a week. The range for facelifts can be from 6000-15000 thousand depending on what is done for you. A minilift can range from 5000-7500. This entails less extensive dissection and smaller incisions. The results are less but this may be what you need to give you the subtle results you are looking for. A traditional facelift will entail more involvement of the face and longer incisions. Also, it likely entails elevating the SMAS and the layer deep to it (superficial muscular aponeurosis) which is central to facelifting. The minilift does not typically elevate the deeper layer underneath the SMAS but entails pulling up the SMAS with sutures without going under the SMAS. 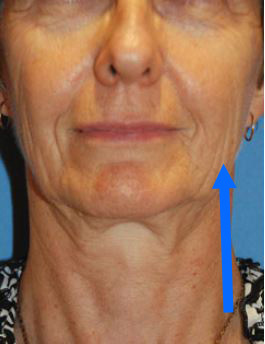 The facelift can lift the neck to a degree but if you want the neck addressed a neck lift would likely need to be done. A traditional facelift ranges from 7500-10500. When you add the neck lift portion to your procedure it will be in the upper region of 9500-12500 (Face and Neck Lift). The range wil dependent on the severity of your face and neck laxity and other factors. The pricing includes your anesthesia and follow-up care. Do I need a facelift or fillers | fat injections? Most people need some filling when you age. We simply break up things in this way. 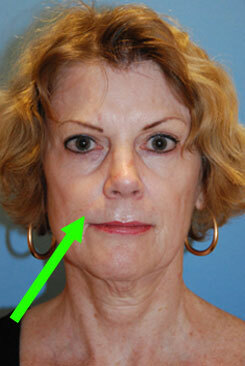 If you have jowls and folds around your mouth, you can use a facelift. 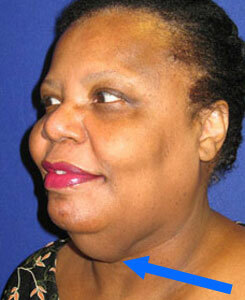 If you have neck laxity and extra neck fat, you could benefit from a neck lift. If you have both, you can utilize both a face and a neck lift. Everything else in the face can be improved with filling and fat injections. The other option for filling is the YoungVitalizer that fills your face with the guidance of Dr. Young's Theory on Facial Beauty. How do I take care of myself after a Facelift? Some of taking care of your Facelift comes before the procedure. Avoiding blood thinners can markedly make your after care easier. You will bleed less. You will have less chance of getting a hematoma, a collection of blood under your skin. You will also have less chance of infection. Making sure that you are healthy enough to have surgery will avoid major problems after your surgery as well. Having someone take care of you after surgery is very helpful. Post operatively, cleaning your incisions frequentlly will help you avoid scarring. Controlling your pain, will avoid bleeding by decreasing your blood pressure and your heart rate. We have patient care packages to help you as well. Click here for our Patient Care Packages.